Can't afford a Paul Henry? You wouldn't be the only one. His paintings frequently fetch six figure sums. Most famously, The Potato Diggers (1910-11) sold for €400,000 at Adam's in 2013. Henry's reputation is stellar. The artist biography section of Whyte's describes him as: "Arguably the most influential Irish landscape artist of the 20th century." This wasn't always the case. It took a while for the Irish art world to catch on to Paul Henry. In 2011 - just over a hundred years before The Potato Diggers fetched €400,000 - it was exhibited in Leinster Hall, Dublin, along with work by four other artists including Paul's wife, Grace Henry. The critics were not impressed. One commented that the Henrys: "seldom rise above the dead level of mediocrity and too often fall below it." It can't have been easy for the Henrys to rise above that one. Ironically, the thing that turned Paul Henry's career around was a poster. In 1925, the London, Midland and Scottish (LMS) Railway Company reproduced one of his Connemara paintings on a publicity poster, widely distributed through America and Europe. It became hugely popular. Between 1925 and 1926 almost 1,000 copies sold and the company commissioned two more posters. Almost overnight, Paul Henry became had become the poster boy of Irish tourism. A prophet has no honour in his own country, but there's nothing like international success for convincing the audience at home. The Irish art world abandoned its reservations and started to take an interest in Paul Henry. His biographer, SB Kennedy records the reaction in 1925: "If thousands of people in Great Britain and America have been led this summer to think over the claims of Ireland as holiday ground, it is largely through the lure of Mr Paul Henry's glowing landscape of a Connemara scene." Paul Henry (1877-1984) had achieved something almost miraculous. He had taken the bleak, empty magnificence of the west of Ireland and turned it into a place where people wanted to go on holiday. Through his posters, he shaped the way that we now perceive the landscape, to the extent that whole stretches of the Wild Atlantic Way feel like you're driving through a Paul Henry painting. British Rail was quick to jump on the band wagon. So were Ulster Tourist Development Association and Bord Fáilte Eireann. All three organisations used Paul Henry's paintings to advertise Ireland as a holiday destination. Now they're highly collectible and by no means cheap (unless you compare them to the price of his paintings). A 1949 British Rail poster for Lough Derg by Paul Henry is coming up for sale in Whyte's Eclectic Collector auction on April 6 (Lot 600: est. €600 to €800). The image is alluring, in an understated way: an empty landscape with a lake in the foreground and hazy blue mountains under a cloudy sky. Travel posters are physically fragile and the early ones are rare. They were never meant to last. Those that survive were often kept by the travel agent, or by some enterprising customer who asked to keep one as a souvenir. Some are collectible because of the artist, others because of what they are advertising. Aer Lingus posters, for example, attract the completist approach: people primarily interested in filling a gap in their collection. In the same sale, a 1953 colour lithograph of Blarney Castle surrounded by trees has text that reads: "Ireland - Fly Pan American - World's Most Experienced Airline" (Lot 601: est. €100 to €150). For collectors, its main selling point is that it was designed by E McKnight Kauffer, an American graphic designer whose work has an international following. An earlier poster in the same sale, Northern Ireland Flax Growing (Lot 596: est. €400 to €600), is based on a painting by James Humbert Craig (1877-1944). The poster was commissioned by the Empire Marketing Board between 1929 and 1930 as part of a series intended to promote trade between the Irish Free State and Great Britain. The poster was already in the auction room at Whyte's, awaiting cataloguing, when someone brought in an oil painting that looked remarkably similar. "Haven't we seen something like before?" the auctioneers asked each other. They went upstairs to find the poster. Sure enough, the image was almost identical. This, they realised, was the original painting by James Humbert Craig on which the poster was based. It went under the hammer as part of Whyte's Irish and International Art sale on March 4 2019 (est. €20,000 to €30,000). It sold for €54,000. Robert Emmet (1778-1803) was hanged and beheaded on a block borrowed from the local butcher. His executioner held the head aloft. Then, both head and body were taken to Kilmainham Gaol “and left for some time in the court of the prison where the prisoners might view it from their cells”. At this point James Petrie (1750-1819), a Scottish miniaturist possibly interned in the debtor’s prison, took a plaster cast of Emmet’s face. 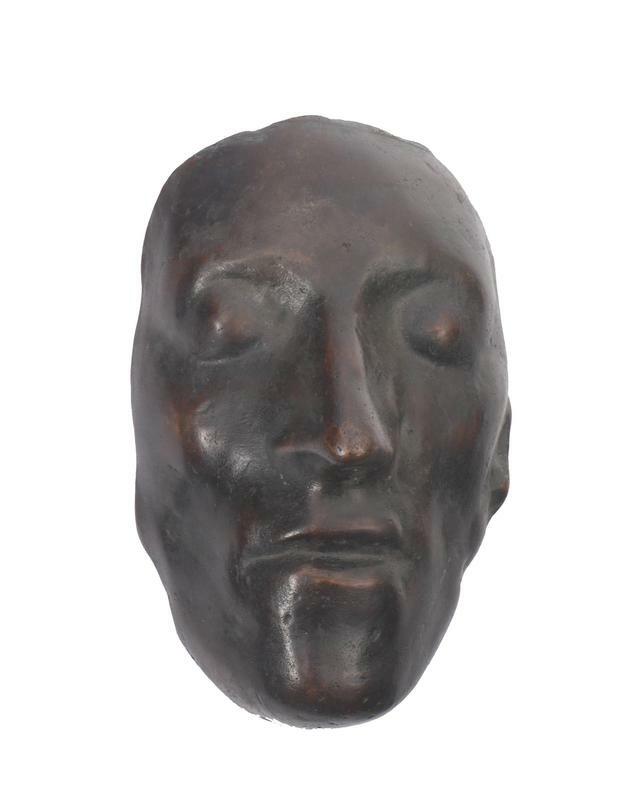 From this mould, he made a number of bronze death masks (above). One of these (Lot 53: est. €800-€1,200) is coming up for in Whyte’s Eclectic Collector auction on April 6. The sale also includes a diorama in a bottle with naively carved bone model of the Polish submarine Orzel sailing out of Tallinn. The Orzel (Eagle) was one of the Polish Navy’s three submarines. She escaped the Nazis in Estonia, navigated the Baltic and around Denmark without charts or any navigational aid, other than a list of lighthouses, repeatedly attacked by both German and British warships. When she reached Scotland, 40 days later, she lay on the bottom until emergency repairs were made to the radio, then surfaced to transmit a message in English. She then took part in the campaign against the German invasion of Norway and, in the summer of 1940, disappeared without trace. The submarine-in-a-bottle (Lot 230: est. €150 to €250) has all the appearances of prisoner-of-war art. It’s easy to imagine a Polish prisoner of the Third Reich de it from scraps of bone.The auction takes place at 11am on April 6 at Freemason’s Hall, Molesworth Street, with viewing at Whyte’s, 38 Molesworth Street, Dublin 2 Wednesday to Friday. See whytes.ie. Expect the usual array of country house contents at Damien Matthew’s two-day antiques and interiors auction, which takes place at Dukes Bros Building, Market Street, Kells, Co Meath, tomorrow and Sunday. The sale includes Georgian, Regency, Victorian and modern furniture; gilded mirrors; Persian rugs; Edwardian and Victorian silver; jewellery; painting and a small library of antiquarian volumes. Viewing continues today from 11am to 5pm and on each day of sale from 11am. The auction commences at 2pm on each day. See matthewsauctionrooms.com. An antiques fair selling vintage and retro items as well as collectables, antiques and art will run in the Cooke Church Hall, Ormeau Road, Belfast, tomorrow. The fair runs from 9.30am to 3.20pm and admission is free. For further details, see collectireland.com. The Galway Antiques Fair, organised by Hibernian Antiques Fairs, will take place in The Menlo Park Hotel, Galway, on Sunday. The fair will run from 11am until 6pm. Admission is €3.50 for men. All women will be admitted free of charge in honour of Mother’s Day.